Interactive Local 404: Can Labor and Management Be Facebook 'Friends'? A New York Times story about the United Auto Workers challenges that particular Karl Marx analysis. 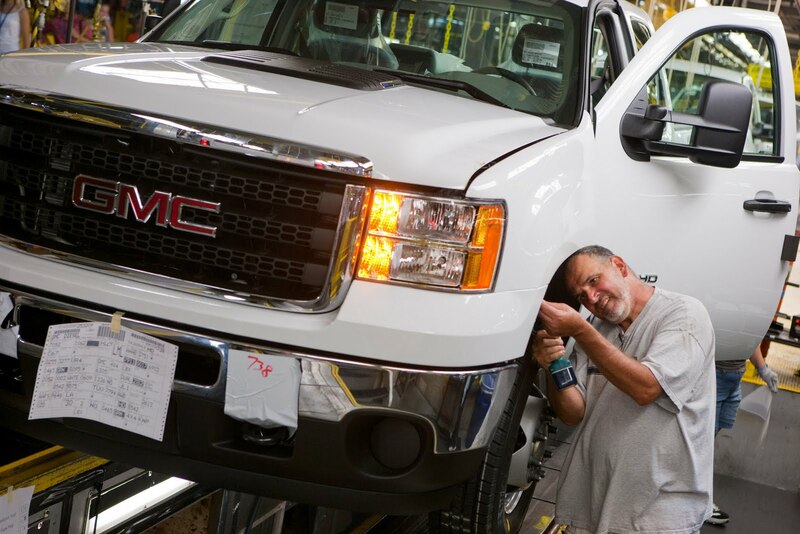 Reporter Nick Bunkley describes how the autoworkers union has been using social media to communicate with members during recent contract talks with Chrysler, Ford and General Motors. And it even points to ways that tools like Facebook, YouTube and Twitter may help management and labor communicate more effectively with each other. "Through Facebook, autoworkers at plants in Kansas City, Mo., or Kokomo, Ind., have been able to voice concerns and ask questions directly to the bargaining teams, something they could not do in past years. Facebook helped workers at a Chrysler factory in Dundee, Mich., gather support before voting last month to join the national contract; they had previously been covered by a separate agreement that provided less job security." "While the U.A.W. worked to repair its Web site last week, it posted a summary of the Ford contract on Facebook, and received more than 500 comments in response. Since ratification meetings started, the moderators of the U.A.W. 's page for Ford workers have been busy answering requests to clarify sections of the contract language, sometimes responding within minutes. "In several instances, the union used Facebook to rebut rumors being disseminated on plant floors or in the news media, rather than allowing them to spread unchallenged." "Mr. Reyes represents a G.M. parts processing plant staffed entirely by entry-level workers, many of whom are in their 20s, new to the bargaining process and more likely to engage one another online than at the union hall. "'They're used to expressing themselves on Facebook or on Twitter. Getting real-time answers is something they have an expectation of,' [Reyes] said. 'Nothing feeds the rumor mill like a lack of information.'" "There's a lot of different filters out there, and this enables us to communicate directly with the membership, and we think that's a good thing." "JUST A NOTE TO ALL RETIREES,IF YOU ARE NOT HAPPY WITH THE WAY YOU WERE LEFT OUT OF THE NEW CONTRACT,YOU CAN HAVE YOUR VOICE HEARD BY CANCELLING YOUR UNION DUES, CONTACT YOUR LOCAL UNION FOR INFORMATION ON HOW TO DO THIS. THANK YOU"
"It is a very sad time when retirees have to worry MORE about what the UAW will do to their pensions & benefits than the company!! They are supposed to protect the things we worked for rather then sell us out." So, can the machines be employed by specialized labor to quell the revolt of specialized labor? Providing a forum for unhappy constituents to share their unhappiness, and then actively responding to those comments and engaging the commenters is a social media tenet. Another social media tenet is that the line between and among institutions and individuals is thiner and fuzzier than ever. That's as true for a union, a company and their members/employees as it is for, say, a government and its citizens, or a media company and its audience. Whether that results in cacophony or symphony has more to do with the players than the instruments. In the end, a machine ain't nothing but a machine. Those new fangled traffic lights are quite a marvel, aren't they? At least they were 75 years ago. Back then, Jam Handy was to instructional films what Walt Disney was to early animation. In 1937, Chevrolet hired Handy to produce a short film explaining "automated signal lights." The devices were just in their second decade of use, and there was still astounding variation from place to place. "Even now," the film's narrator said, "traffic engineers are working with safety councils toward a national standardization of the traffic signal system." "It's easy to forget that at one point in our history, there was no national standard that red meant stop, and green meant go -— many cities operated their own unique versions of automated traffic signals, some with four colors, and others with only two." Actually the use of red and green signal lights pre-dated traffic lights. Credit for adapting the color-coded signal system used by railroads for automated traffic management goes to William L. Potts, an inventive Detroit police inspector who also gets credit for another innovation: the first police car equipped with an experimental radio. Something Just Clicked: A Date With Destiny? "Computers and society are out on a first date in this decade and for some crazy reason we're just in the right place at the right time to make the romance blossom." -- Apple co-cofounder Steve Jobs in 1983. That was the year before Jobs' company introduced the Macintosh -- "the computer for the rest of us," as it was promoted at the time. The original asking price for the Mac: $2,495, or $5,440 when adjusted for inflation. 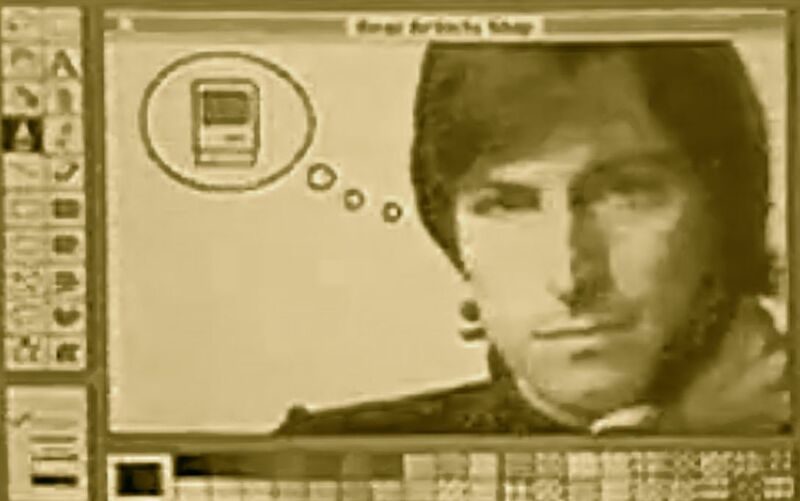 "When Jobs died Wednesday at 56 after protracted combat with pancreatic cancer, the world lost a valuable shuttle diplomat between computers and tablets and gadgets and animated robots, and the people who so desperately long to relate to them." Linton added: "He is not gone. He will not be forgotten. His soul is in the machine." 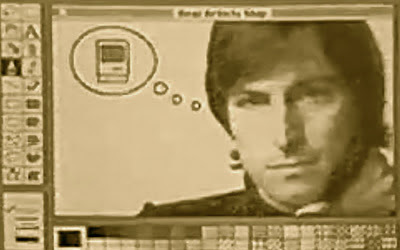 The image above is from Jobs' presentation in January 1984, when he publicly unveiled the Mac. And the quote up top from 1983 comes from author Steven Levy's 1994 book, Insanely Great: The Life and Times of Macintosh, The Computer That Changed Everything. That may be the front page that shows up most in the history books. But the far-less-remembered front page from the previous day's Times is the one that most suggests what the future of news would look like 99 years later. And it may even offer a little inspiration to the news editors of today -- especially in their struggles to seamlessly take in and integrate the continual flow of news links and social information from around the world. These days, eye-witness videos and accounts posted in Twitter-length dispatches give far-flung journalists almost immediate access to firsthand information. Those details are often skimpy and sometimes unreliable -- but not more so than the preliminary and even "blurred" radio reports the Times used to tear up its front page late one Sunday night a century ago. This was news as it was happening -- events still in the present tense. A disaster was clearly underway, even based on what little had been heard directly from Titanic's crew by 12:30 a.m. -- nearly two hours before the infamously "unsinkable" ship went under. The information the Times had to work with that night was based on radio communications monitored by a remote wireless station operated by the Marconi International Marine Communication Company on the southern tip of Newfoundland. Marconi radios were the international Twitter feed of their day. "CAPE RACE, N.F., Sunday night, April 14--At 10:25 o'clock to-night the White Star line steamship Titanic called 'C.Q.D.' to the Marconic wireless station here, and reported having struck an iceberg. The steamer said immediate assistance was required. "The last signals from Titanic were heard by the Virginian at 12:27 A.M.
"The wireless operator on the Virginian says these signals were blurred and ended abruptly." "HALIFAX, N.S., April 14.--A wireless dispatch received to-night by the Allan line officials here from Capt. Gambell of the steamer Virginian states that the White Star liner struck an iceberg off the Newfoundland Coast and flashed out wireless calls for immediate assistance." But the adjacent "tick-tock" -- the Titanic "live blog" -- clearly did a better job conveying the drama and uncertainty of that night's events. There are lessons in this for today's digital editors. Too many of us in online news still depend too heavily on a newspaper-like convention of completeness to tell breaking news stories -- as if we were somehow editing our homepages to be sold on street corners and thrown from trucks onto doorsteps and driveways. But instead of delivering completeness we often end up providing a simulated thoroughness -- a "completeness falsity" that can unintentionally and artificially overstate what we know and understate what we don't. We post long, scrolling stories that top with the facts as we know them, even when we know them to be incomplete, if not misleading. We "weave in" updates, challenging users to click on headlines that often read remarkably like they did before the story was updated. Then we ask the readers to hunt through a thousand or more words of text again for any newly added quotes or details or background. These stories seem to be written and edited for one-time visitors. We also carefully segregate our conversations with our audience and our sources from "the story" itself, even when our audience and our sources are the same people, and even though social media channels like Twitter and Facebook make those conversations far more public than our sites are designed to integrate and convey. Tools that help sift and present selected social media posts, such as Storify and Storiful, have started to change that, but most of us still have a ways to go in how we showcase this material. None of this is to say that dependable old-fashion prose no longer has a place in breaking news. But leaning more heavily on other ways of telling the immediate story can free a news site's prose writers to focus on meaning, explanation and implications -- angles that tell readers where stories are going, rather than trying to keep up with an ongoing event. Most of us in the breaking news biz are still trying to come up with new designs and presentational metaphors that put all the pieces of our coverage together in a way that captures both the significance and drama of the events we're covering. The work of bygone "newspapermen" from our industry's past may help point the way. The New York Times coverage of the Titanic's sinking reminds us that even newspapers once knew how to break the conventions of the completeness falsity -- especially back in the "extra, extra," "Sweetheart, get me rewrite" era of competition and multiple daily editions. 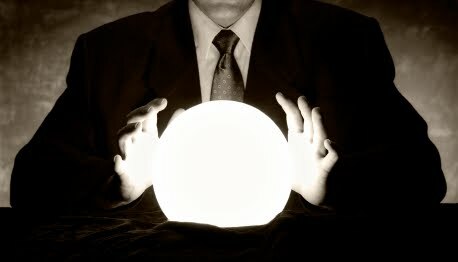 Tapping those deep-seated instincts again will serve us as well in 2012 as they did in 1912. Updated: Corrects link to TimesMachine page in kicker above. Fast fingers sink ships! "That's the great thing about spaceflight. One day, you're doing the most outrageous thing humans have ever done -- spacewalking. The next day, you're fixing toilets and packing boxes." -- Astronaut Michael Fossum, after Expedition 28 cremate Ronald Garan successfully repaired a toilet aboard the International Space Station. CBS News has a full account of Wednesday's extraplanetary plumbing job. 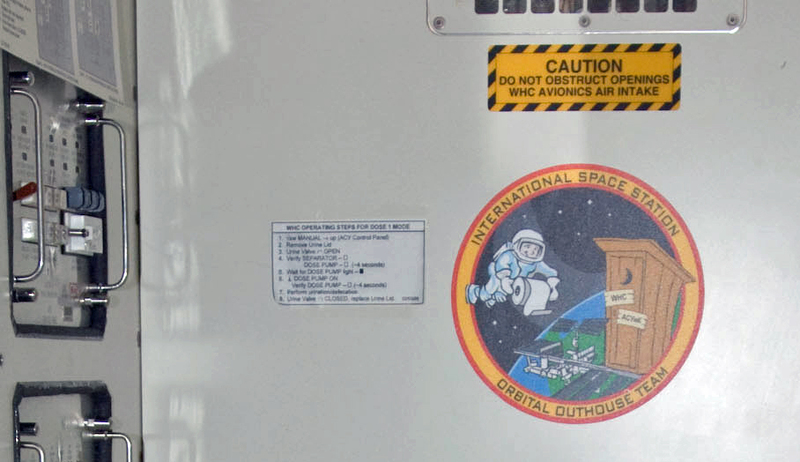 The "Orbital Outhosue Team" logo above appears on the wall over one of the station's two commodes -- a $19 million Russian-built toilet system delivered by the crew of the STS-126 mission in November 2008. This 90-year-old photo shows the U.S. Navy's ill-fated H-1 blimp passing over the boardwalk at Far Rockaway, N.Y., during a brief series of test flights in the summer of 1921. The picture was taken by my great grandfather, Leon Goldberg, a lifelong photo enthusiast. My grandmother and I discovered it in a long-overlooked family album earlier this afternoon. The original image is small -- 3 inches by 3 and 3/4 inches. So the people in the foreground didn't catch my eye until I scanned and enlarged the photo. Absolutely everyone is looking up at the airship -- many shielding their eyes from the sun, some waving. A half-dozen boys are standing on the rails of the boardwalk for a better look. One almost looks like he's reaching up to the passing craft and its three-person crew. But I especially love the pair to those kids' right: the woman in the hat and a long dress, holding the hand of a well-dressed little boy. I imagine looks of quiet amazement on their proper faces. The wonder my great grandfather's photo captured reminded me once again how far aviation has advanced in just 90s years -- one lifetime. My grandmother was born just six years after her dad snapped this picture. Now she watches space shuttles rocket into orbit from her kitchen window in Vero Beach, 80 miles away from the Kennedy Space Center. But the H-1 blimp's test flights were not such a high point in aviation's history. The airship's final journey must have attracted a wide range of bewildered looks -- and explains why there are so few pictures of this short-lived aircraft. The H-1 was the Navy's smallest blimp at the time. 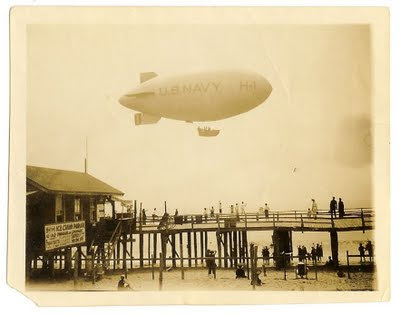 An official Navy history says the craft was built by Goodyear and arrived by rail at Naval Air Station Rockaway in Queens in May 1921. "Various trial flights were conducted" that summer -- until. . .
"On August 5, 1921, a malfunction in the engine caused her to come down. The landing was especially hard and the car tipped overthrowing the crew out. With the H-1 lighter, minus her crew, she ascended again and flew off on her own, making a gentle landing in a pasture near Scarsdale, N.Y."
"A good part of the population of Scarsdale, attracted by the sight of the balloon cavorting mysteriously over their city, raced after it as they saw it suddenly begin a graceful descent. After narrowly missing a church steeple and a couple of flagpoles in its descent, the H-1 finally settled down to earth without a jar." The crowd at Crane farm "captured the unruly aircraft" and tethered it to a tree, the Times reported. And "air officers who examined the blimp said that it was intact and ready to be used again." "A farmer found the airship and tied her to a tree. Unfamiliar with LTA [lighter than air] vehicles, he used the cord attached to the airship's rip panel for securing the airship. 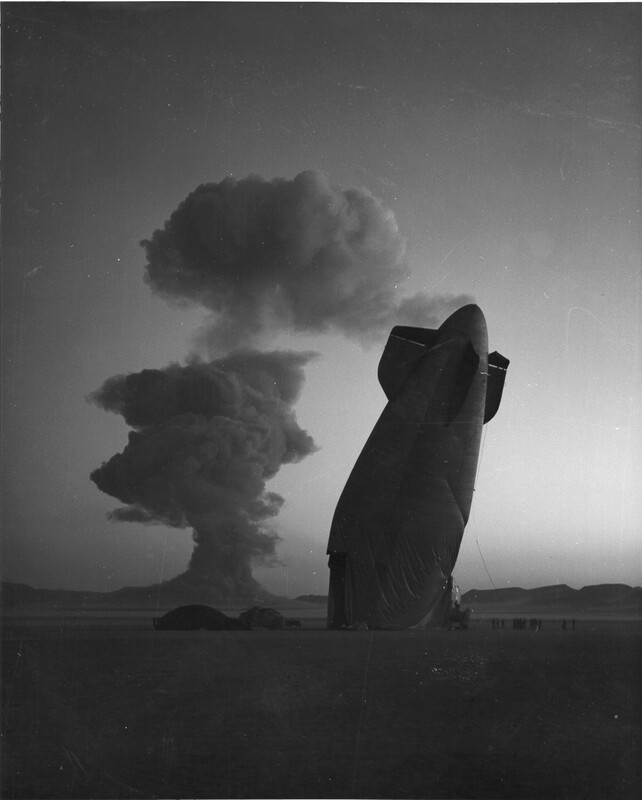 During the night, the wind caused a strain sufficient to pull open the rip panel and deflate the H-1. The airship was recovered and returned to the hangar at NAS Rockaway where, on August 31, 1921, she was destroyed in a fire." Tuesday marked the 50th anniversary of the Yuri Gagarin's Vostok 1 mission and the beginning of human spaceflight. It also was the 30th anniversary of the first U.S. space shuttle launch. But last fall another significant milestone went largely unnoticed: the first 10 years of continuous human presence in space. 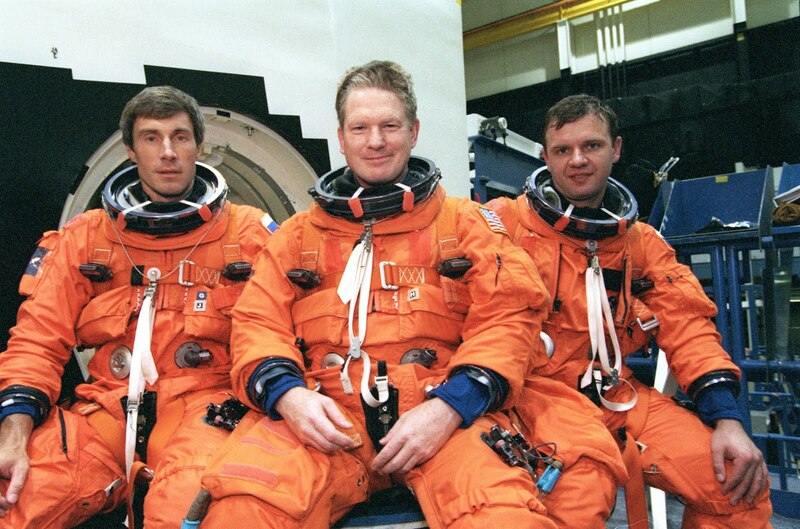 On Oct. 31, 2000, a three-person crew (pictured above) lifted off in a Russian Soyuz spacecraft to begin the first of a series of extended missions aboard the newly opened International Space Station. "I think that on that day a decade ago, we truly became a space-faring species," astronomer/blogger Phil Plait wrote last fall. Will astronaut Bill Shepherd and cosmonauts Yuri Gidzenko and Sergei Krikalev be remembered by history as Earth's first space colonists? That depends on whether the continuous presence that began with their five-month mission -- now 3,815 days and counting -- ultimately represents the starting point of a permanent presence. Since their Expedition One mission in 2000-2001, more than two-dozen overlapping crews and dozens of short-term visitors have spent time aboard the orbiting outpost. While space travel remains a hazardous occupation, the routine of regular personnel rotations 180 miles above us made last year's anniversary easy for most earthbound humans to overlook. Catherine "Cady" Coleman, a member of the station's current six-person crew, underscored that Tuesday when she and the rest of the Expedition 27 team reflected on the significance of Gagarin anniversary in a video link with reporters. "Now, just 50 years later, living in space is considered to be practically normal," the astronaut said. Coleman explained how her fourth-grade son's classmates "think it's perfectly normal that his mother calls from space and helps with homework." But of course all of that is far closer to amazing than it is to normal. As Coleman put it, "We've really come a very, very long way." "Find me the lyrics to James Brown's 'Hot Pants.'" A decade ago, I proposed that test to the American Journalism Review as a way for news managers to quickly gauge job candidates' digital competence. These days, that's hardly a test at all. With oodles of online lyrics databases to choose from, the words to Brown's 1971 hit are just a Google search away. But back in 2000, my online pop quiz was actually a trick question. I had just offered a few bucks to the first coworker or colleague who could find me those lyrics. It was a stumper, and the winner arguably cheated: consultant Mark Potts (now blogging at "Recovering Journalist") downloaded the song and transcribed it. I was reminded of my old test during a recent meeting with two recruiters from the human resources department at NPR, my current employer. The recruiters wanted to know what they could ask job applicants to help them cull the weak from the webby -- and how exactly did I define "webby" anyway? "Webby?" The term sounds strangely dated, especially when I already find myself distinguishing between what I call "Web classic" (desktop and laptop browsers) and other online experiences (social experiences, tablets, mobile and so on). And yet I still need people on my staff who combine great journalism skills with an innate understanding of the potential and perils of those new platforms -- and the ones to come. Figuring out what to ask a journalism job candidate is bit easier when you're recruiting for technical positions. But a traditional print or broadcast journalist submitting his or her resume for an online gig doesn't need to know PHP -- or even what PHP is -- to make the digital leap. They just have to live and work in the world of this century's news consumers. Simply asking what blogs people read is a revealing enough question, especially given how many professional journalists still dismiss blogging. Note: Those whose answers only include blogs hosted by major media sites only get partial credit. Having a personal or professional blog is worth bonus points. I often recommend to people I know looking for new news jobs that they give themselves an assignment to blog about. It's a great way to learn some fundamental concepts about layout, content management and other aspects of online publishing. It also is helpful to hiring editors, since it lets them see an applicant's raw, unedited copy. What's the best story idea you got from a tweet or some other social media outlet? Who is the most interesting or useful person you follow? Hyped as Twitter is, a beat reporter who doesn't use social media to identify and contact potential sources is like a beat reporter who's afraid to use a phone. At this point I actually want a job candidate to be the person who tells me what the next Twitter or Tumblr is. The same goes for mobile apps. Asking which apps a candidate uses is an efficient way to find out if a candidate knows which way online publishing is moving -- literally. If your job candidate does not know what Gowalla or Foursquare is, that's okay. They still might be a good contender to work on your online political coverage, but probably not to help reinvent the way you cover your local arts and entertainment scene. The truth is, traditional journalism skills -- speed, accuracy, instinctive fairness, facility with a range of story types and formats -- are still as valuable in any online newsroom as they were back in the days of pneumatic tubes. That's why journalists with backgrounds at wire services and afternoon newspapers often have adapted to the rhythms and needs of today's newsrooms faster than others. Likewise, many magazine editors and writers inherently get the power of lists, graphics, Q&As, galleries and other alternatives to classical news story forms. One online journalist I worked with was Martha Angle, a legendary Capitol Hill reporter/editor who recently announced plans to retire after a 47-year career. Martha began covering Congress and national politics at the Washington Star, D.C.'s long-defunct evening paper. Six years ago, when I arrived at Congressional Quarterly (now CQ Roll Call), Martha was the newsroom's one-person "continuous news desk," writing and editing breaking news copy for our webiste and a midday e-mail news bulletin. Apparently our business still has room for a "consummate line editor" with an "uncompromising dedication to getting it right and getting it out to our readers quickly" -- just to borrow a couple of lines about Martha from her retirement announcement. The news business also needs people with original ideas for ways the Web gives us to tell, convey and present stories. One way to find innovators like that is to look for people who recognize it. "Seen any really innovative uses of the Web for news/information lately? I'm looking for examples to blow my class's minds -- interesting story presentations, creative mapping, smart uses of data, whatever." The answers to Mark's e-mail were wide-ranging. One person called out a Chicago Snow CrowdMap experiment, produced during a blizzard by the Chicago Tribune, WGN and the Chicago Weather Center. Another flagged "Staying In Bounds" -- a fact-based, news-inspired role-playing game produced at UNC-Chapel Hill to explain NCAA's challenging ethics guidelines. I shared a link to the Sunlight Foundation's "Checking Influence" browser tool. Check your credit card or bank account transactions online and Sunlight's helpful "bookmarklet" shows you what your money is really helping buy in the halls Congress -- which issues are on your merchants' lobbying agenda, and on whom are they lavishing political donations? I appreciated all of the examples Potts' friends shared. But ultimately I was more focused on Mark's question than the answers. The people I most need to hire in my newsroom are not the ones who see the evolution of the news business the way I see it. They are the ones whose answers blow my mind -- the people who see what I'm missing. "In a world where most people consume their news safely, perhaps in a comfortable chair on some electronic device, it is worth remembering how dangerous news-gathering has become. . . .
"News flows so freely and easily these days -- on Web sites, on cellphone apps, on Facebook and Twitter and YouTube -- that it seems almost effortless. "Getting it still requires old-fashioned courage and perseverance." -- a New York Times editorial following the safe return of four of that newspaper's journalists from Libya. "If he died, we will have to bear the burden for the rest of our lives that an innocent man died because of us, because of wrong choices that we made, for an article that was never worth dying for. No article is, but we were too blind to admit that." Another example of courage and perseverance is the story of Mohammed "Mo" Nabbous, 28, "the face of Libyan citizen journalism." Last month, Nabbous started an Internet TV station in Benghazi called Libya al Hurra, or Free Libya. On Saturday, Nabbous was shot and killed. NPR's Melissa Block and Andy Carvin remembered Nabbous on Tuesday evening's All Things Considered. Listen to their story to hear Nabbous's final report during an intense firefight. Andy is NPR's social media strategist and our primary voice on Twitter, where he has become a discerning conduit for first-hand reporting by emerging online voices speaking from difficult places around the globe. The Guardian called Andy "the man who tweeted the revolution," but Andy would give more credit to others -- including Nabbous. "Mohammed was a pioneer, but he wasn't alone. I think he helped show Libyans that they should feel free enough and safe enough to record their stories so the rest of us could bear witness." The memorial to Albert Einstein near the National Mall in Washington is an off-beat tourist attraction. Where else can you have your picture taken sitting in the lap of a 12-foot high bronze statue of the physicist? As a journalist, "truth" is not a word I'm comfortable with. It's a bit unattainable to me. My editorial aims are impartiality and fairness and thoroughness. Yet that Einstein line about "truth" was on my mind again last week, as Christine and I prepared for a presentation that we did together for a regular forum on science, reason and religion hosted by the Unitarian Universalist congregation in Oakton, Va.
Christine and I organized the first part of our presentation in the form of a marriage counseling session between the worlds of science and journalism. 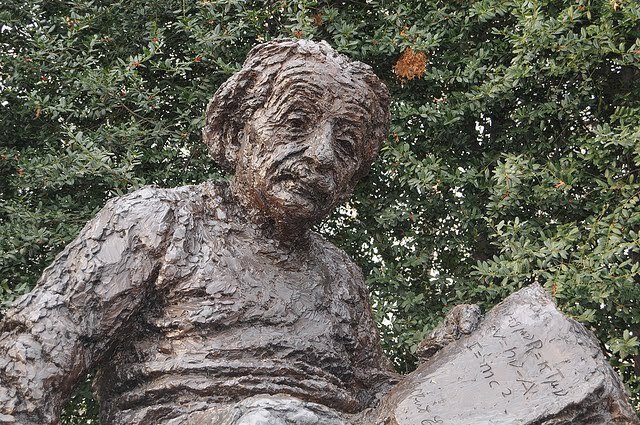 Our main points: Scientists and journalists share a common interest in uncovering facts that we hope explain larger truths -- lowercase "T," not necessarily the truth Einstein spoke of. 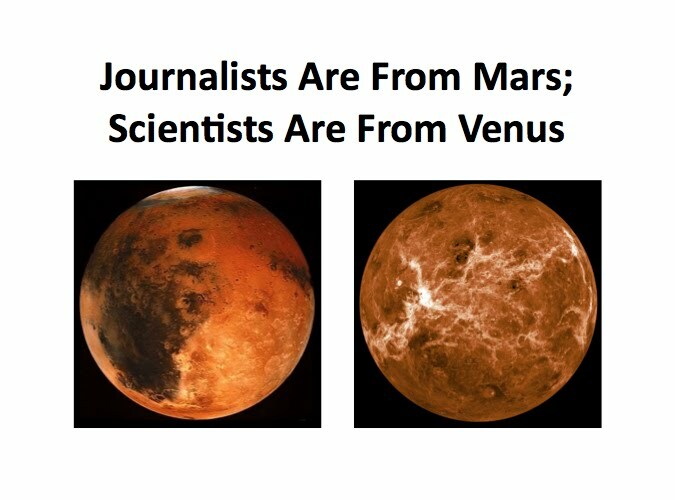 And the scientific method and the journalistic method both are based on an incremental accumulation of facts and data. But the methods of science and journalism are also often at odds, especially when it comes to conveying nuance and explaining the significance of anecdote and narrative. One old newsroom adage: "Two's a pattern. Three's a trend." Not exactly the makings of a peer-reviewed article in an academic journal -- but those journal articles sometimes aren't what they're cracked up to be either. Christine and I also talked about the ways the scientific and journalism worlds depend on each other -- as demonstrated by the parade of experts consulted to help explain this past week's news from Fukushima, Japan. Likewise those experts often depend on media attention to help call attention to and, frankly, fund their work (the "no bucks, no Buck Rogers" rule referenced in Tom Wolfe's The Right Stuff). Scientific truth is often a moving target. 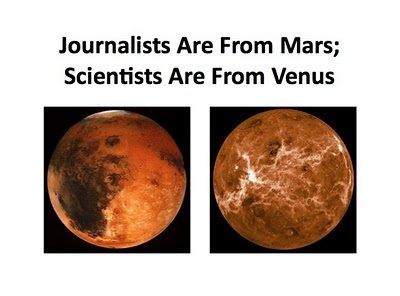 And sometimes, science misses the mark -- and takes the media along for the ride. My friend and creative partner Eric MacDicken and I tried to make that point in an "Office Opossums" cartoon we posted last year. My own faith in the infallibility of science is no greater than my faith in the infallibility of journalism. That said, my faith and skepticism in both institutions are mostly in balance -- and I am a long way from cynical. But based on the questions Christine and I heard after our talk today, I suspect many scientifically oriented people are more skeptical of the work of my journalism colleagues than they are of the research we might cover. I saw that in some of the immediate responses to an item posted this evening on NPR's health blog, "Shots." "To reach the radiation dose limit for a power plant worker, you'd need to drink 2,922 eight-ounce glasses of milk. To raise your lifetime cancer risk by 4 percent, you'd have to drain more than 58,000 glasses of milk." The article quickly set off an active discussion among online commenters. Some appreciated the in-depth explanation ("The math doesn't lie"). Others strongly took issue with it ("If you believe the opposite of what they tell you on the news, you are, in all likelihood, closer to the truth"). "The public house is a place which gives people the opportunity to exchange views and ideas on public affairs. As far as I can see, such an opportunity is lacking in this country, the result being that the Press, which is mostly controlled by vested interests, has an excessive influence on public opinion." Einstein's remark better describes the U.S. media of 90 years ago than it does any of the news organizations I happen to have worked in. But unfortunately, for many viewers, listeners and readers, the grand physicist's observation still has a ring of truth. David Broder: The 'Interactive' Journalist? "The future fascinates us, because we hope to live in it. But the press has a responsibility to bring the discussion back to the concerns that really matter in people's lives." -- Washington Post columnist David S. Broder, in a 1999 online chat, answering a reader's question about why the the public and the press "is so obsessed with predictions as opposed to issues." David, who was my first boss in Washington, died Wednesday. He was 81. 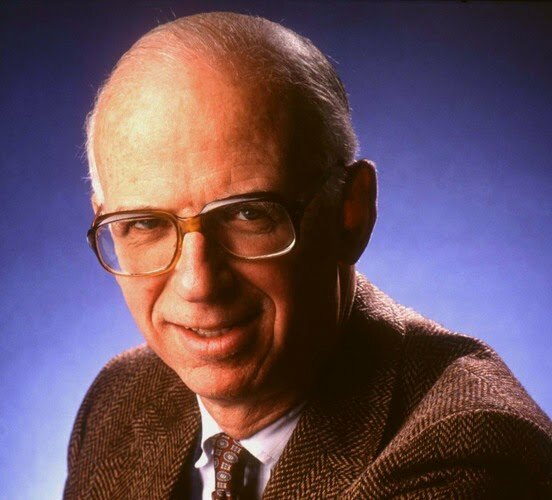 As the Post's Dan Balz wrote, David was "the best political reporter of his or any other generation." Generationally, David was more of a typewriter guy than a laptop guy. 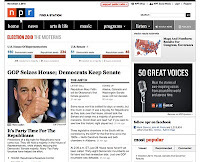 My own remembrance for NPR ("Broder's Shift Key") focused on how David's commitment to "lowercase-'I' interactivity" gave him a prominent -- albeit unlikely -- role in the early stages of the Post's transformation into a multimedia publishing company. That online chat from 1999 quoted above was just one example. "I would like to see us say -- over and over, until the point has been made -- that the newspaper that drops on your doorstep is a partial, hasty, incomplete, inevitably somewhat flawed and inaccurate rendering of some of the things we have heard about in the past 24 hours -- distorted, despite our best efforts to eliminate gross bias, by the very process of compression that makes it possible for you to lift it from your doorstep and read it in about an hour. If we labeled the product accurately, then we could immediately add: But it's the best we could do under the circumstances, and we will be back tomorrow with a corrected and updated version. "If we did that, I suspect, not only would we feel less inhibited about correcting and updating our own stories, we might even encourage the readers to contribute their own information and understanding to the process. We might even find ourselves acknowledging something most of us find hard to accept: that they have something to tell us, as well as to hear from us. And if those readers felt that they were part of a communications process in which they were participants and not just passive consumers, then they might more easily understand that their freedoms -- and not just ours -- are endangered when the search warrants and subpoenas are visited on the press." NOTE (11-28-2012): The remarks Alan quoted came from a speech David gave at the National Press Club in 1979. When I first posted this I'd forgotten that David included a longer excerpt in his 1987 book Behind the Front Page. I tweaked a couple of introductory sentences above accordingly -- if only to underscore David's point about "corrected and updated versions." 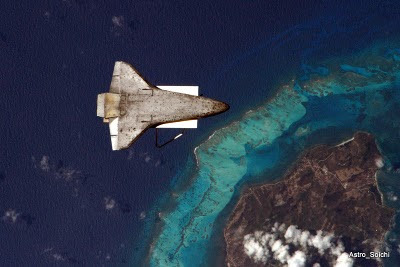 "I think about this space shuttle fleet like the clipper ships that were strong and fast and powerful -- they did their jobs but they were also graceful and beautiful. They conjured up imagination -- of foreign travel, exotic places, of exploration. And Discovery is just an elite member of this elite fleet. The clippers faded, and it was because there was an alternative, there was another ship that was coming in, steam power, that was stronger, faster perhaps, but not quite as beautiful. . . . We don't have that yet. . . . [W]e don't have that follow on." -- Discovery astronaut Michael Barratt, in a CBS News interview on Tuesday. Space shuttle Discovery's 39-mission career ended today when the NASA orbiter landed a the Kennedy Space Center in Florida. Discovery was the third and oldest surviving vehicle in NASA's shuttle fleet. Since its maiden voyage in 1984, Discovery circled the globe 5,750 times, traveling a total of 148 million miles -- more than one-and-a-half times the mean distance between the earth and the sun. As NPR's Nell Greenfieldboyce reported this morning, Discovery's next stop is one of 21 museums "vying for the chance to become a retirement home for one of the iconic space shuttles." The stunning photograph above shows Discovery backing away from the International Space Station after an April 2010 visit to the orbital outpost. The picture was taken by Japanese astronaut Soichi Noguchi, whose space photography I wrote about last year. 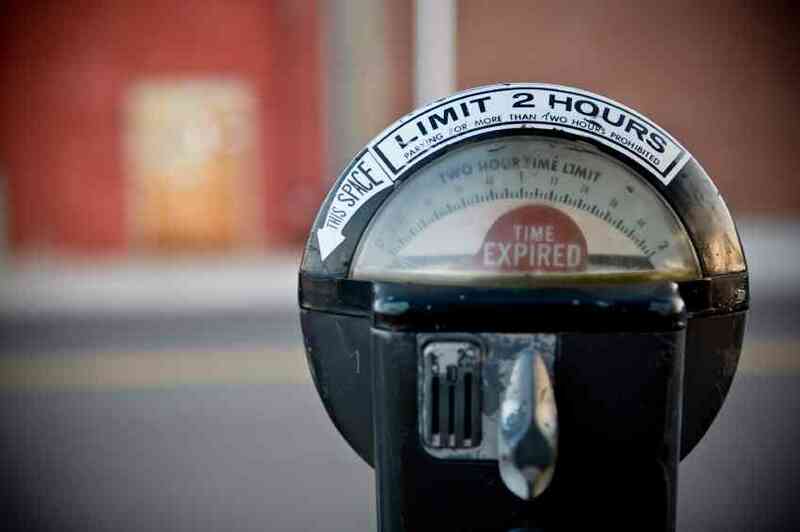 "We will look back at this time and the flowering of technology as one that transformed parking. The closest comparison would be the invention of the cash register in the 19th century, which totally transformed commerce." -- Donald Shoup, a UCLA urban planner who studies parking, transportation and land use. Shoup was quoted in a recent USA Today story on how new mobile apps and in-car technologies are changing the way people look for parking spaces. A related story focused on one particular mobile app: "Parker" from a company called Streetline. But what the app-maker calls "smart parking" is just a stepping stone in the company's vision for building "smart cities" -- using "live data from the real world to support sustainable development and transform the way people live and work." "Imagine if cities could speak to us -- if they could give us live status updates on traffic patterns, pollution, parking spaces, water, power and light. Imagine how that kind of information could improve the economic and environmental health of the city, for residents, merchants, and visitors. Imagine how it could improve working conditions and productivity for the people who maintain the city." Imagining these data-driven cities of the future turns out to be the easy part. Tech-minded urban planners and entrepreneurs have been noodling about wired "info cities" for ages and ages. One far-sighted friend of mine, Geoff Halstead, even launched a business along the same lines as Streetline -- but Geoff's focus back then was traffic rather than parking. Mobile carriers were beginning to integrate location information with every cell call -- mostly to help emergency responders with 911 calls. But the commercial potential of this location information looked like it would sprawl out faster and farther than a suburban strip mall. "This whole infrastructure will be built," Geoff told Business Week at the time. "And behind it will be a huge opportunity to offer position-based traffic services." That was more than a decade ago -- when those of us who were tinkering with early version of mobile online services thought we'd have iPhone-like devices in hand within a couple of years. 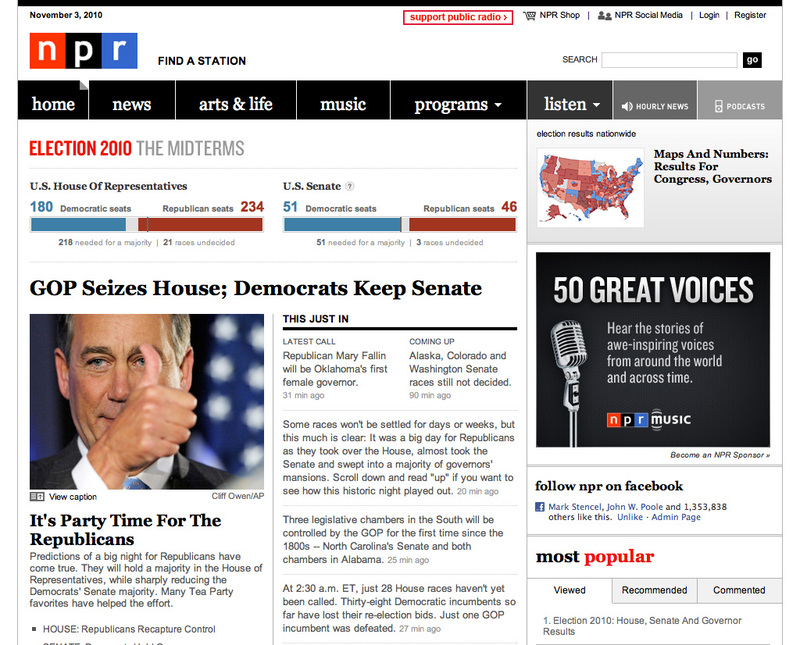 Alas, the mobile Web evolved far slower in the United States than a lot of us expected. These days I frequently refer to an online traffic service very much like what Geoff had in mind in the late 1990s: It's my Google Maps app. Mainstream mobile technology and services are now accessible, affordable and robust enough that companies as big as Google and as small as Streetline once again seem to be hearing the virtual "cha-chings" of those 19th-century cash registers that Professor Shoup mentioned above. This time I just hope the idea has enough change to park. "Well, I am writing to you now because I have some news, and I wanted you to hear it from me first. My dalliance with that trim new Droid from Verizon is over, too. In Facebook terms, the relationship was complicated." -- from my public breakup letter to AT&T's iPhone, posted this morning on NPR's "All Tech Considered" blog. Some of the initial reader comments on my posting were interesting. One reader wrote that we should stop thinking that any particular company or product is magic: "Time to think of products as products and services as services." Another said, "I really think its the serial phone daters that drive up the price of what is essentially a commodity (chip sets, internal parts OEM'd from the same manufacturers, eerily similar features on different OS). A smartphone is a smartphone." I know they're right, of course. I keep telling myself that, too. And then I gaze at those pretty screens, and, well, I'm lost all over again.